Lane-splitting, the act of riding between lanes of traffic or sharing the lane with another vehicle, is a nerve hitter in motorcycling. Like loud pipes, helmet use and fluffy kitten videos, it’s a subject that brings the masses out of the woodwork. But when a recent CMG Facebook post about a University of Berkley study on the subject broke our record for number of shares and comments, we figured it deserved a closer look. As a UK ex-pat lane-splitting is an issue close to my heart. I spent my youth filtering through lines of motionless cars, and when those drivers saw me coming they often moved over to make space. This rider-cager symbiosis allowed me to maximize the very essence of the motorcycle design – svelteness, manoeuverability and agility. But, the motorcycle has its downsides too – it leaves the rider vulnerable in a mishap as well as exposed to the elements. I accept these gains and limitations every time I slide a leg over that saddle and put the key in the ignition, but it astonishes me when other road users and lawmakers deem that all vehicles are the same (i.e. cars) and therefore must follow the same rules. When a motorcycle and a car collide, inevitably it is the motorcyclist who comes off worse despite the majority of the collisions being the car’s fault. And if it’s raining and I’m just discovering that that cold shock to my nether regions is a leak, I don’t feel compelled to inflict the car driver to the same misery just because they have a warm and dry box to shelter in. No, although I wish car drivers would be more observant and not take out so many motorcyclists, I recognize that they have a vehicle that has some obvious benefits as well as some obvious limitations. They can’t feel the pure joy of swooping from flowing corner to flowing corner with the sun shining and birds singing my rider prowess on a fine summer’s day. Nor the (somewhat corny, but also somewhat true) freedom of the open road, that makes a good road trip a lifelong memory to cherish and take to the grave. But, especially in an urban situation, their obesity does not just contribute to traffic constipation, it creates it. To keep the analogy going, motorcycles are the laxative to unbung the urban condition and filtering through the four-wheeled stools helps keep everything regular. There is a good reason that the courier vehicle of choice in Europe’s cities is two-wheeled – it’s the only way to cut through congestion in a timely manner. So why oh why is the practice effectively illegal in North America, save for the lone state of California? The University of Berkeley recently conducted a study on the state’s lane splitting by reviewing almost 6,000 motorcycle-involved traffic collisions (some fatal, some without a scratch), of which 1,000 of them involved the act of lane splitting. Most of the lane splitting occurred during weekday commutable hours (as in many did not lane split when the traffic was lighter). Injuries were significantly different between lane-splitting motorcyclists (called LSMs in the study) and other motorcyclists, with LSMs less likely to suffer head injury (by a factor of 1:2), torso injury (2:3), or fatal injury (2:5) than non-lane-splitting motorcyclists. LSMs were also much less likely to be rear ended, although they would be more likely to be the offender and rear end a car. Interestingly, LSMs were also more likely to be wearing better helmets and traveling at lower speeds as well as being less likely to have used alcohol. In short, they were not yahoos. the increase in speed differential (between the LSM and the traffic they are splitting) was more of a factor in injuries than overall speed. a speed differential between traffic up to 15 mph mark had no discernible bump in the severity of injuries as it did when greater than 15 mph, giving a sweet spot as such, below which the data argued that lane-splitting did not add to the chance of injury over regular riding. not only does high-speed lane-splitting increase the risk of serious injury, but it has less benefits as the traffic is already moving, so you’re not stuck. The idea being that if you keep lane-splitting down to a max differential of 15 mph with a max speed too, you get almost all the benefits without increasing the risk of injury. Reduced congestion – filtering is not queue jumping as by moving out of the main lane you are removing yourself from the queue and riding off into the sunset. You also free up a space for the lardier vehicles and so reduce the wait time for them. It’s a classic win-win for everyone. Reduced fuel consumption and emissions – if you’re sat in traffic and not moving, or moving every slowly, then you’re burning fuel and inefficiently at that, for very little gain in distance travelled. Reduced motorcyclist injuries – the LSM can distance themselves from other traffic and significantly reduce the odds of being rear ended as a result. Improved viability to other road users – by placing themselves in open sections of the road, it allows the LSM greater choice in where they position themselves. Closer proximity to other road users – meaning the LSM has less time to react to a situation and is more vulnerable to cars suddenly and unexpectedly changing lanes or opening doors (which is likely where the LSM’s higher likelihood of rear ending someone else comes in). Surface issues – between two lanes is where you’ll find slippery lane markings and raised objects, which add to the hazards. Queue jumping – which it isn’t, but its perception is sufficient to annoy the trapped car driver and could result in episodes of road rage. It’s obvious that if you made lane-splitting legal in Canada over night that there is a greater potential for more accidents in the short-term. Canadian drivers are not the world’s best by any stretch of the imagination but they also do not expect to see a motorcyclist riding between lanes. I know, because when I first moved to Canada I regularly filtered through the masses of congested traffic in my new home of Toronto. You could see the look in the rear view mirror, the turning in of the wheels and the pull forward and inward to block my way (which ironically left enough room for me to now go behind the car and pass on the other side). I eventually ceased the activity when the draconian so-called stunting law came into effect and the police started using it to seize the bikes of unsuspecting lane-splitters – an activity that ultimately helped convince me to make the move out of Ontario. But I digress. 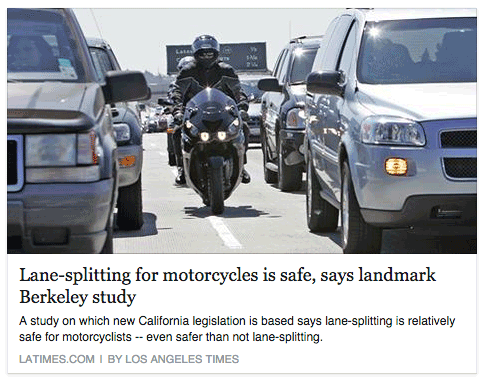 My point is, no matter what the perceived risks of lane-splitting are (and this study does conclude that they are perceived if the speed differential is kept down), surely the fact that the list of benefits far outweighs the cons alone should be sufficient, nevermind that just by making it legal does not make it compulsory. Allow me to exercise my judgement and decide when to pull into a wide space to carry on my journey. By all means, stay where you are and ponder if that cold shock to the privates is a leak or not, but let me free up my space for another car to pull up into, while I save fuel, emissions and time, and take charge of my own safety to get home a little quicker. Depending on the width of that lane it is actually legal to do so…if that lane is for parked vehicles only. Cael – Interesting idea. I’d prefer to see it open to all though. Christopher – I fully agree with that analysis. Such a shame that Ontario has become so craven to traffic revenue. If it is illegal to ‘share’ the lane with a car, then why is it OK for a car to ‘share’ my lane when I’m turning left on a two lane road and the motorist wants to go straight through or turn right? Motorists will take the space you leave them when you are on a motorcycle all the time. No one raises a fuss if they pass by your exposed right leg by inches. Do the police have a problem when you use a lane of the road with the occasional parked car in it? I sometimes use that space between the parked car and the (stopped or slowly moving) car in the adjacent lane to move ahead in traffic (in effect, sharing the lane with a parked car). Curious about the legality of that. I support filtering, as getting to the front of the line of traffic in Toronto is a pure win in the two wheeled world. And on Friday afternoon of a long weekend, lane splitting makes a lot of sense on the 400 Highway northbound, so I’ll endorse it, but my opinion is suspect as I can tolerate a higher level of risk than many of the lawmaking weenies out there. Pay for the privilege? No thanks. Well said. I wonder if lane splitting should be pitched to the gov as an endorsement on your licence, like air brakes. Pay a fee/take a test, you get a check on your licence that qualifies you to lane split. The gov gets money in, and they get extra paperwork! Win-win for them! OPP officers get ahead mostly by tickets, not by much else. Fantino wanted to make the Stunting Law take effect at 20 over, not 50 over. He also expressed an interest in dropping the highway speed limit to 80kph. The incentive here has never been to improve traffic flow or safety, it’s been to increase revenue flow. I’m surprised there hasn’t been a big push for lane filtering in BC and Ontario where traffic is a real issue.